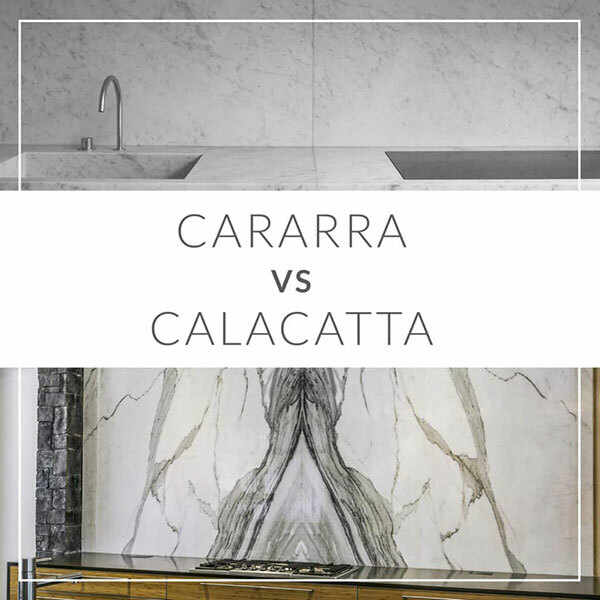 One is called Calacatta and comes from the Carrara region of Italy. The other is called called Carrara and comes from Tuscany. Of the two types of marble, Carrara is darker. It is grayer in hue and its veining is usually softer. The veining is usually more linear, too, meaning you won't get wild veining patterns. This makes Carrara perfect for fireplace surrounds in spaces that are more formal. It also works well in the kitchen. marble countertops made from Carrara add the distinguished, clean look that marble is known for, but because it has a gray color, it adds a touch of warmth, too. In fact, Carrara's gray color can be used to add a touch of color to any room in which white is the primary color. It can be used as a backsplash (which can really tie a kitchen together when combined with Carrara marble countertops) and as a wall in a bathroom that's primarily white. Calacatta is renowned for its bright, white color and and dramatic veining, both of which make it perfect for any room in which you want to infuse some energy. It's veining rarely follows a linear pattern. This makes Calacatta perfect for large expanses, including walls, floors and showers. It instantly adds class and sophistication to any room. In the bathroom, it transforms an otherwise ordinary shower into a spa-like experience. In a great room, it adds a dramatic centerpoint. There are many more differences between these two magnificent marbles, and to learn more about them, contact us today.